Golf clubs are designed to meet the needs of your particular ability level and swing speed. An older, robust golfer in terrific physical condition might play the same irons as a PGA Tour professional. 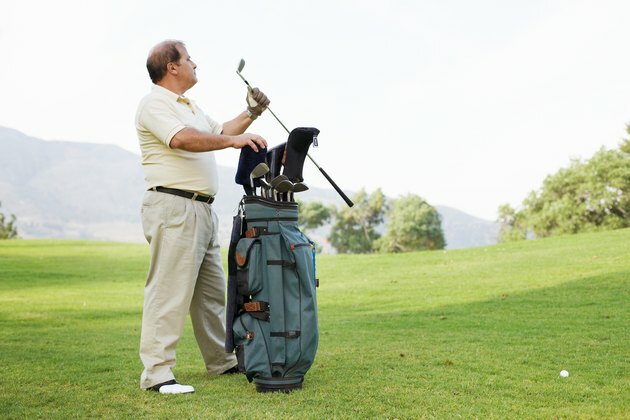 However, because most people lose strength, power and coordination as they age, senior golfers should consider clubs that help compensate for the effects of aging. A wide range of irons can keep your game in the pink. Your swing speed is likely to drop as you age, so you need irons that are more flexible in order to maintain as much distance as possible. If your swing speed is declining, a whippier club can impart more energy to the ball at the point of impact. As TaylorMade explains, shaft flexes usually are categorized as ladies, for swing speeds under 60 mph, seniors, for swing speeds between 60 and 70 mph, regular, for swing speeds 70 to 80 mph, stiff for speeds between 80 to 90 mph and extra stiff for speeds over 90 mph. People generally lose coordination as they age, and golfers who do so are likely to miss the sweet spot on their irons more frequently, costing them distance and accuracy. Game-improvement and max or super game-improvement irons are manufactured with more weight distributed around the clubface and thus a bigger sweet spot. The soles are wider, which keeps you from digging into the turf as deeply and hitting irons fat. And the center of gravity is lower, which makes it easier to launch the ball into the air. So if you're not making crisp contact with the ball, switching to more forgiving irons might be the solution. Golf Hall of Fame member Johnny Miller advises seniors to lower the kickpoint on their irons. The kickpoint is the area on the shaft that has the most bend in it, and it affects the flight of the ball. As Miller writes in "Golfweek," lowering the kickpoint produces a higher trajectory with additional carry. Miller also advises adding some weight to the clubhead to add explosiveness to your shots. However, that advice is counter to conventional wisdom, which holds that lighter clubheads help you generate more clubhead speed. As golf club guru Tom Wishon writes in "Links Magazine," "There is no such thing as one-size-fits-all golf clubs. You don't buy suits off a one-size-fits-all rack, so why do the same with clubs?" A good club fitter matches your equipment with your swing and physical abilities, and both can change over time. Although club fitting once was reserved for elite golfers, it's now available to the masses at many golf courses and golf stores. That's a good things, says Wishon. "The worse you are, the more you need custom-fit equipment," Wishon writes.